When you need the power of heavy-duty precision and the flexibility of 4-axis turning, you need a Bardons & Oliver 4-axis system. These technologically advanced CNC turning machines carry the fastest spindle speeds, greatest Z-axis thrust capacity, largest thru-hole capacities and highest spindle horsepower in the industry. Learn how we help transform your manufacturing process. Built on a heavy machine base, the column-style design includes rigid turret and slide and free-falling chip flow for durability and efficiency. With 12 or 15 stations per turret, you get interference-free tool design and optional live tooling. 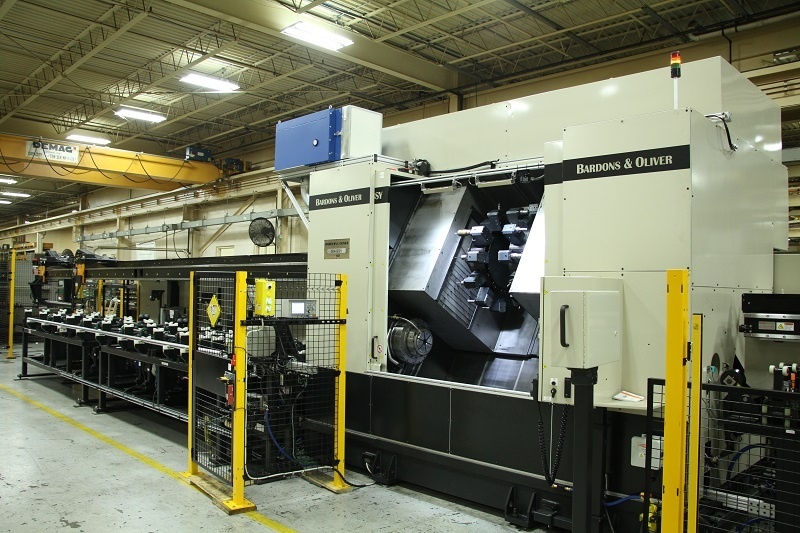 Featuring low-maintenance coolant management and automated part loading and unloading, these domestically built Bardons & Oliver 4-axis CNC machines are proven workhorses for your demanding heavy metal turning applications. Bardons & Oliver has been meeting engineered challenges for more than a century. Rely on our industry-leading innovation, quality, precision and customer focus.